I really need some help and advice on setting up some speakers with a switch. I really don't want to blow up my amp or speakers by doing something dumb. I want to use a speaker switch so that I can use two pairs of speakers with my one amp. I want to use them in my room and outside in my gym. I want to be able to turn off the music in my room and play it only in the gym and vice versa. I also would like to have both playing at the same time if possible. A + B: Gym and room at the same time. 4. 4 speaker switch I couldn't find a two speaker switch in my area. 1. Connect speakers as per diagram into the switch. 2. Connect switch into amp. 3. Turn on amp and play music. If I need to listen to room A, I flip the first switch if I want room 2 I flip switch two. If I want both of them at the same time I have both on. Can anyone tell me if this is safe to do with my equipment. I am not good at electronics so I am quite clueless. Is the switch I have found sufficient to do this? Is it safe? I personally don't need individual volume control in each area as I can just turn it up on the amp or the computer. I just need to be able to have all four speakers playing at the same time and also playing in isolation of each other. PS. Sorry for the long post. 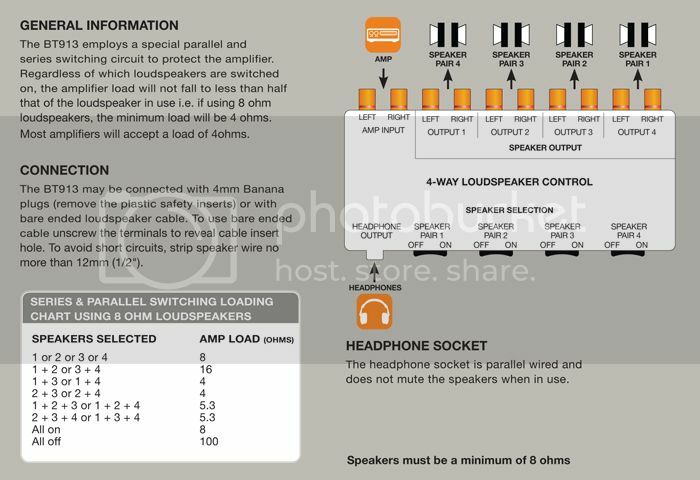 Does the switch you have confirm if it is wired so that when playing two speaker sets they are connected in series? If yes you will be fine. Thanks for the reply. I'm not sure. If you look at the pictures, I have included the switch that I was going to buy. It has a diagram on the back of the packet. I planned to wire the individuals speakers into their respective pair slots (negative and positive). Then I planned to take wire from the switch into the amp (negative and positive). That's as far as my electrical knowledge goes. Can't read anything on the package of the switch box, pic is a bit fuzzy so can not say. I have re-sized and re-uploaded them. Is this a bit better now? If not I will have to go back to the shop and get better pictures. Thanks for the advice guys. I went and bought a speaker switch, but the only one I could get has RCA outputs on the speaker switch instead of bare wire outs. I bought four RCA jacks and I have speaker wire so I can solder them. The only problem is I am unsure how to solder them. From here you can see the outputs of my amp. The way I understand this is all four RCAs correspond to the four outputs I have on my amp. If I solder each RCA with both negative and positive wires I will end up with 8 wires to plug into my amp. I am not sure this is correct. Must I solder one only one "negative" wire that will go to the specific "negative" outputs on the amp and the switch?